Hmmmm....is that a CZ .22 you got for Christmas? Made by scum sucking commie bastids in Czecho...Czecki...that bastid east bloc puppet state I can't spell properly? If so - seriously - get that cheap glass off it and put on Swarovski or Zeiss, 3x9. Yes, these rifles are that good. that, comrade, is a Marlin. And it was out because Zhukov received a new scope for it - along with his flannel shirt. 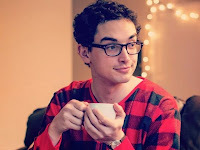 I'm perpetuating your anti-pajamaguy meme...will post similar picture on my blog of self in flanel with gun and mug of Cocoa/HotChoc/Black Coffee/Beer whatever.....excellent plan.